Rory McIlroy loves his tennis but it's hard to imagine the Holywood tyro playing a few sets with a member of the press corp the day after a Ryder Cup. And yet that kind of camaraderie and sporting 'brio' was par for the course for the Irish Independent's form rugby and golf correspondent Colm Smith, who passed away last Friday and will be sorely missed by the sportsmen and women he covered from his arrival in Abbey Street as a cub reporter in 1958 until his retirement in 2001. "Colm was one of the great characters," recalled Des Smyth of those more innocent days when Smith, a former interprovincial tennis player, was a regular on the golf circuit. "We spent a lot of time together over the years and he was a hell of a character and a great tennis player too. "When I played my first Ryder Cup in the Greenbrier in 1979, we were free on the Monday and I fancied myself as a bit of a tennis player. "Of course, I thought it would be no problem to take Colm out. But no, he beat the bejaysus out of me. He had me running around the court. He was great fun and I enjoyed his company for years." Eamonn Darcy, Paul McGinley and Pádraig Harrington all look back fondly on those days when "Smithy" roamed the fairways from Rosses Point to Muirfield Village — a fellow sportman and kindred spirit. "I was only thinking of Colm today and how he was doing," Darcy said just a few hours after calling time on his 50-year career last weekend. "I thought about him this week. "How can I describe it? It was a thing of the past the way things were dealing with Colm. He was old school. He was the best." Harrington went from promising boy to Ryder Cup star under his watch, describing the late scribe as "such a positive influence on my career and a good friend." He added: "He will be great missed but not forgotten. RIP Smithy." For McGinley, he was part of the Irish golfing family that made the good days better and eased the pain on the bad days. "Colm was just part of that great Irish entourage with Dermot Gilleece (read Dermot’s tribute to Colm here) and Charlie Mulqueen that covered all the amateur golf when I was coming up," McGinley said. "Then when we went on tour they would regularly come to events. "He was always a friendly face, always very fair and good company. We'd see him and his wife Helen too and he was part of the fabric of Irish golf — that bigger Irish family we all benefited from over the years. Colm was part of that." The great amateur Mary McKenna said: "He was so much a part of our tournaments. He knew everything about the game and was always a happy face and good craic. He was probably there for most of my wins — just a great pal. Every time you'd meet him, you'd just pick up where you left off. "He was very knowledgeable about the game but there was also lots of banter with all those boys, like Dermot, Charlie and John Redmond and Edmund Van Esbeck. The reporters were so much of our golf back then and made our events feel all the more important, at home or abroad." His sense of humour and bonhomie made him popular with his colleagues across the Irish Sea, as the Daily Mail's former golf correspondent Michael McDonnell — a frequent house guest and regular "foe" in the golf writers' Home Internationals — recalled after Monday's requiem mass. "I remember being in Dublin with him once, walking along by the Liffey and saying to him, 'Which side of the Liffey are we on now Colm? ', to which he replied, 'Well this side, obviously.' That's the kind of guy he was and typical of his dry wit. "He was always great company and a terrific competitor when it came to playing golf." Colm, whose father Billy was the chief reporter for the Irish Independent when he joined the paper in 1958, was the first man the golf writer and golf course designer Pat Ruddy called upon when he dreamt up the Golf Writers' Home International matches in 1992. "Colm was one of those men with ink for blood," Ruddy recalled fondly of a man who would become an eye-witness to so many historic sporting moments, just as his father (a keen member of Clontarf) had chronicled epoch-making events in the history of the State, such as the harnessing of the Shannon at Ardnacrusha or our first tentative strides in civil aviation. "He was second generation Independent House and very welcoming to those of us who came from the country but needed marking as he would still seek the scoop from under your nose. Professional! "He was shy, hidden behind gentle brusque, but gregarious and responsive to a sporting challenge. When I conceived the Home Internationals for Golf Writers, he was the first man called because he knew everyone in the profession in UK & Ireland having spent many hours on the road and 'at the bar' with them. "His particular pals Michael McDonnell of the Daily Mail and Richard Dodd of the Yorkshire Post, who holidayed in the Smith home very often, were quick to respond to his call and the event took-off in style with flag raising, the Artane Boy's band and R&A captain Joe Carr setting hearts thumping at the newly opened St. Margaret's. 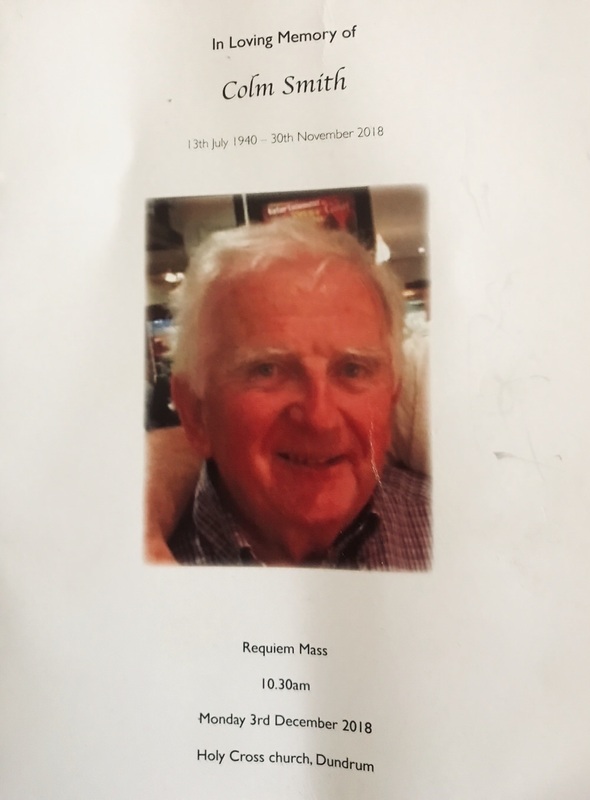 "He loved to play golf and was good from a medium handicap, and his choice of fourball partner was Charlie Mulqueen of the Cork Examiner. They became inseparable as they remained undefeated for about a decade and revelled in repeat wins over Dodd and McDonnell as 'the auld enemy'. "His most joyous week of golf happened when he and Charlie gained the deciding point for Ireland in the Home Internationals at The European Club despite a mid-round crisis when the pair landed in a water hazard in a golf car! "When the win was secured there was no time for the modern jump in the lake. No question of spraying the champagne... just put the bottles to the head and rejoice. "He was admirable in every way and not least because of his steadfast devotion to story gathering and telling, even staying up until dawn in hotel and clubhouse bars seeking inspiration. He was one of a great generation of hardened newsmen. "As time went by came the glamour days at British Opens, US Masters and Ryder Cups. But he never forgot his happy start with, for example, many years of attendance at the West of Ireland at Rosses Point. Colm’s former colleagues, Dermot Gilleece, Michael McDonnell and Charlie Mulqueen. "With the story filed and after a few drinks with his friends, he would drift into the darkness across the Greenlands towards his wee rented caravan for a short rest before getting back into the middle of the action. "He'll be in the action, waiting for his pals, when we follow him out-of-bounds. We will miss him greatly and express sympathy to his family on their loss." According to Forgive Us Our Press Passes, which chronicles the history of the Association of Golf Writers, his old headmaster, upon hearing of Colm's appointment, declared, "lt must be nepotism." And it was. "There was no formal training," Colin recalled in those pages. "Just a five-year apprenticeship learning the trade. It was tough, but it was thorough. Not a bit of glamour. "You were glad to get out of the office even if it was to cover the dog racing and then pick up the table tennis or badminton results later, but l graduated to higher-profile sports like currach racing in Galway Bay and lacrosse in Alexandra College." When he protested that he knew nothing about these sports he was told: "Just ask. You’ll learn." Rugby was another great love and he never forgot how the Lions beat the Springboks in the 1974 series in South Africa, where the celebrations (as much as the rugby itself) were to become the stuff of legend. "Willie John McBride, the massive Lions captain asked him, 'Excuse me sir, how many will there be?' The manager stared for a moment, then burst out laughing. So did the Big Man." That trip to South Africa took place at the height of apartheid and it left its mark on "Smithy" who arranged with Fergus Slattery to take a clandestine tour of the townships in a taxi. "The segregation he saw, shocked him an affect him deeply," his friend, Fr David Tuohy, told the congregation at his funeral on Monday. "A number of years later he was asked to speak at an ecumenical service for sports people at St Patrick's Cathedral. His address included a moving account of that secret tour and his reaction to it. "Behind that gentle piece of gamesmanship, Colm was happy to have done some political journalism and built awareness of a serious injustice."